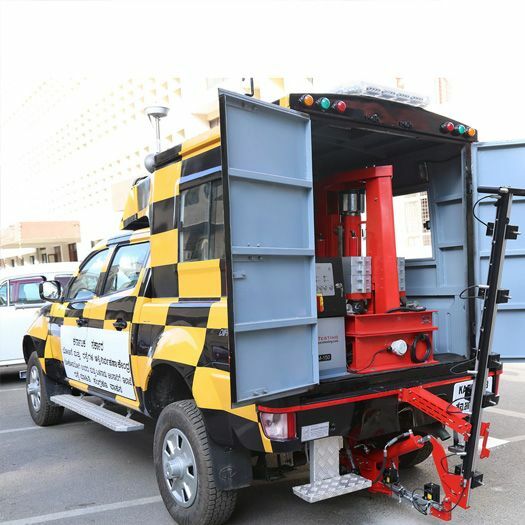 The Pavetesting VM -150 Falling Weight Deflectometer, Vehicle Mounted is used to simulate the load pulse generated by a moving vehicle by measurement of the vertical deflection response of pavement to an impulse load for evaluating pavement structural condition and in selecting optimum pavement maintenance and rehabilitation strategies. 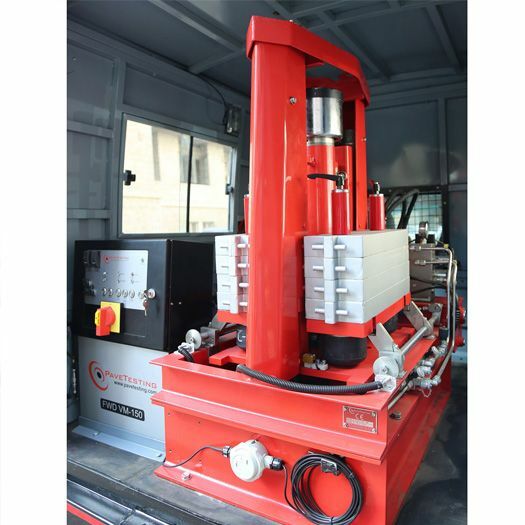 FWD is used to achieve fast and repeatable in situ characterization of pavement layer stiffness. 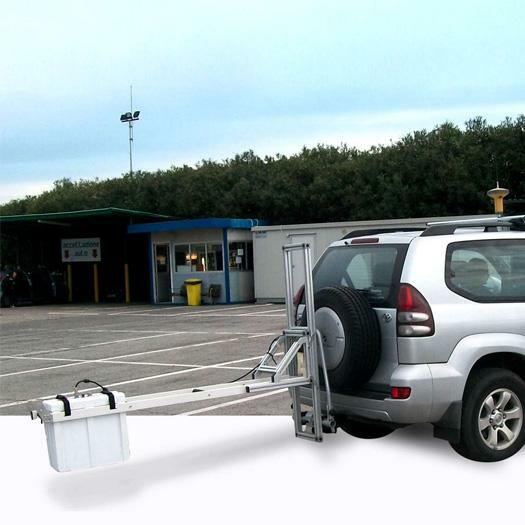 PaveFWD closely simulates the duration and amplitude of the load pulses produced by a single heavy moving wheel load – based on transient impulse load delivered by the FWD to the pavement. Pave FWD can be accordingly used for evaluating structural condition of in service pavements using deflection data from FWD as well as other pavement data inputs for determining elastic moduli of pavement layers. An FWD can also be used in determining the actual material used and in what combination to build the pavement surface. Why FWD: Knowledge of the existing pavement condition is vital to the success of any pavement rehabilitation project. The FWD plays an indispensable role in evaluating the pavement structural condition. 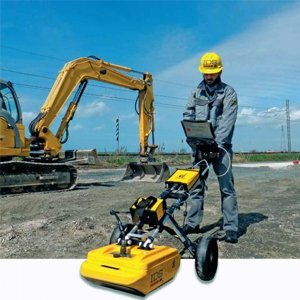 The goal of lower cost, improved pavement quality demands more precise assessment of the pavement layer qualities, making the in-situ measurement of design parameters like stiffness and modulus necessary. By applying FWD test results, pavement analyses and design are carried out in a more rational and accurate manner than relying on simple assumptions or engineering judgment. This can lead to crores in construction costs saved, annually on road - pavement projects. Operation: Measurements are recorded at preset? Distances along the surface when the FWD is stationary. At? Preset heights, a load is dropped to cause a controlled load pulse? In to the ground. Sensors are placed at preset distances from the? 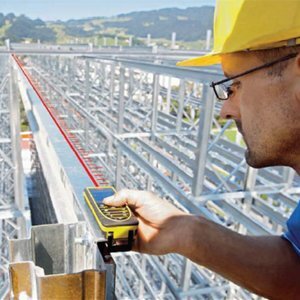 Load plate axis, measuring the deflection of the surface at high? Resolution. Sensors: The Vehicle mounted FWD is configured with a minimum of 7, typically 9 Geophone deflection sensors with capability to incorporate additional vertical deflection sensors to measure the pulse wave outward from the load axis. 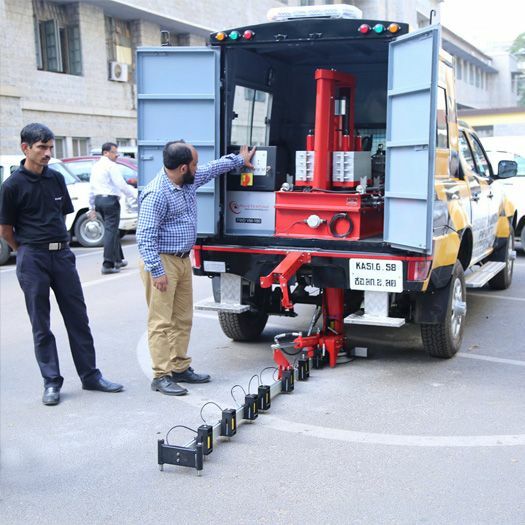 The equipment based on a 150kN load cells and multiple geophones is fast and requires typically 40 seconds to perform a test from stoppage of vehicle to end of test. 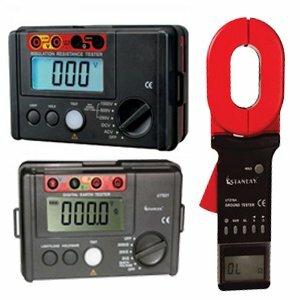 Geophones offered are Digital which incorporate calibration data allowing direct reading of calibration data via the FWD system and also allows plug and play of geophones. Standards: The FWD is internationally and now also in India standardized per guideline IRC 115-14 as the equipment and method of choice in selecting optimum pavement maintenance and rehabilitation strategies. 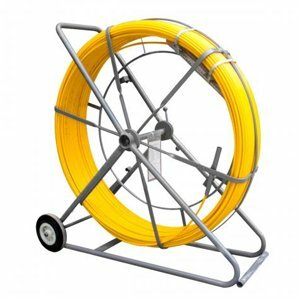 The PaveFWD Complies with ASTM D4694 “Standard Test Method for Deflections with a Falling Weight Type Impulse Load Devices”. What is the remaining life of the pavement? What is the overlay required to achieve the design requirement based on evaluated traffic conditions.? 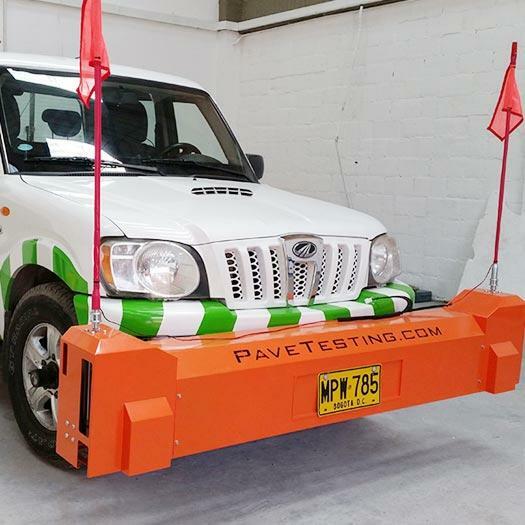 Vehicle: Stanlay in association with Pavetesting can integrated the VM-150 FWD into a suitable Indian manufactured vehicle of 4x 2 or 4x4 design or van based on customer requirement. 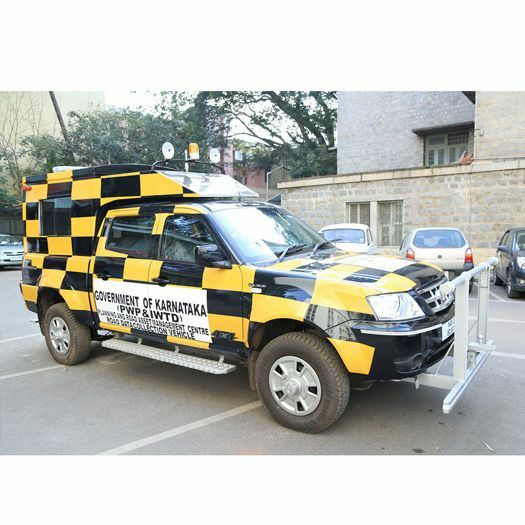 Vehicle can in addition be suitably designed with additional features such as Double cab with integrated laptop table, warning lights, dash board navigation amongst other features. Additionally, DGPS for dynamic acquisition can also be integrated into system. 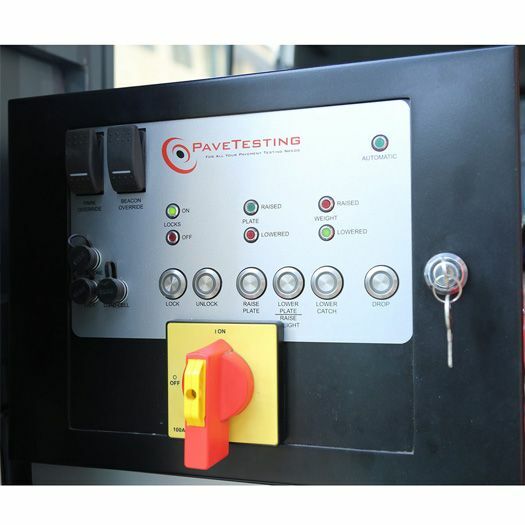 Stanlay in association with Pavetesting UK has supplied a number of FWD’s in India configured to customer requirements. Call us or write to us to know more. Easy transportation by truck, if required. Easier parking at HQ or during work in congested areas.